Prospecting: new directions and territories for artists’ practice Symposium held on 1st November 2018. This symposium started in a bizarrely appointed room at the heart of The Art House of the University Centre Somerset. This conventionally laid out conference room, with screen at the front and rows of chairs, was carpeted with fake grass and decorated with fake topiary. The noise level was high even with the mushroom-like acoustic baffles suspended from the ceiling which were oddly reminiscent of the baffles hanging inside the auditorium of the Albert Hall. There was also a large stack of deckchairs in one corner which were the subject of more than one speculative conversation during the day’s frequent breaks. All of this inside the brutalist edifice of The Art House gave the start of the day a mildly otherworldly air. Like a Mad Hatter’s tea party for the assembled artists. The actual meat of the day was, however, pretty far from whimsical. From the strict timing to of each element of the day to the topics under discussion it was quite clear that the day was going to be about the business of art. To the uninitiated ‘business of art’ may sound like a bit of an oxymoron but Art (note the big ‘a’) has always contained more about business than the average artist is entirely comfortable about. This business-like approach could easily have made the day something of a drag. Luckily all of the talks and workshops I attended were served with a good dollop of positivity and enthusiasm that made the day bounce along quite happily. From what I could see even the most jaded attendees were buoyed along on the tide. Even before we attended we were given tasks to do, so there was no one who got away with just observing the proceedings. In our welcome email we were asked to prepare a one page something (text, picture, c.v. or what have you) to stick on a ‘this is me’ wall and we had to include one thing we were really proud of. We were also asked to bring along a couple of issues or provocations to add to a ‘what do we need to know wall’. Finally we were asked to invite another artist to attend via our phones during the afternoon presentations and Q&A. I didn’t really relish the prospect (see what I did there?) of homework but it didn’t seem onerous, so I had arrived prepared (barring a slight misunderstanding with dates which meant I had no artist in my phone). The attendees were a good mixture of familiar faces and new faces from around the West Country and further afield. 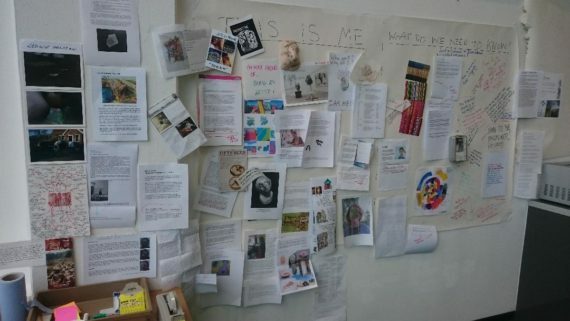 We all clustered around the ‘This is me’ wall as we pinned up our bits about ourselves and had a good nose at everyone else’s. I was surprised at how many were pretty conventional artist statements or C.V.s but there were also a few pictures, collages, a tree and a silver box of poetry. After a quick cuppa our first task, after a brief introduction, was to find someone we’d never met before and pair up with them for the first exercise of the day. My partner in crime was Chris Ivory a newcomer to SAW and a woman with some very cool plans and with very little preamble we were talking over and writing up plans for the next two years. Talk about being thrown in at the deep end but, with no time to be shy, I feel that it worked well as both a way to get to know a new fellow artist and a taster of the day in general. After planning our two year goals it was time for our first seminar/workshop of the day. There were three to choose from: artists and writing led by Lara Eggleton, artists and galleries led by Kerry Harker and artists and resilience led by Lydia Catterall. I had chosen artists and writing for the morning session and artists and resilience for after lunch. Writing, for artists, can mean so many things from being an integral part of their process for creating art, through to writing artist statements for press releases and galleries into being a way of making money through art journalism and everything in between. Lara Eggleton was quick to point this out and narrow down our focus via a quick poll of what we were interested in working on in that session. The majority were interested in art journalism, reviews etc., and writing artist statements. They were both things that she felt we could work with in the time allotted. I found the way she spoke and interacted with us was very down to earth, something I value, she was also very clear and concise, another good trait in my opinion. The three exercises (two and a half, really) that we completed were in that they were all about getting the maximum, clearest, information in the shortest time. To that end we started off turning to the person next to us and each of us, in turn, trying to explain our practice in 30 seconds. A genuinely horrifying prospect for a lot of artists, judging by the expressions around the table: it was one of those moments when you really feel how long and how short 30 seconds can be. After that the next two exercises were a piece of cake, relatively. Overall I found the session useful to me and it certainly added a couple of strategies to my toolbox when it comes to writing. One of the other things about having a tailored approach to this seminar is that each person gets more of what they need out of it and the conversations with people who took the afternoon session with Lara were from a different perspective altogether. Lunch, as ever, was time for talking over the morning, meeting more new faces and catching up with local art world ‘gossip’. The afternoon started with artists and resilience for me. Something I’ve always struggled with, I have to admit. Lydia Catterall was exactly the sort of person you’d hope for leading this seminar someone up-beat without being irritating. After all anyone who can get excited about a podcast about concrete is my kind of person. This session focussed on connections: personal, community, art, business and social. She led us through writing up a spider diagram about ourselves so we could map out our connections, our skills, who we admire, and where we interact. I found it quite surprising as I had not laid out those things where I could see them before. Some of the other things discussed were things like ‘self-care’, a phrase bandied about on social media far too much, although Lydia called it ‘topping up your tank’ which I think is actually a better way of putting it. We were encouraged to think about what tops up our tank and what it might look like for us, she said she often used walks by the canal and listening to all sorts of podcasts to top up her tank and that each person would have different ways to top up. Towards the end of the session we were all encouraged to write our name on a long piece of paper and around our name write one from each category; Who do I know, What do I know, What communities am I part of Who do I admire and What media do I interact with. We were then asked to join up the things we had in common until we had a massive web of connections. It was quite an eye opener to see the common themes and interests running through the group and where people had unique experience. I’m not sure if it helped me to be more resilient but it definitely gave me an appreciation of my unvoiced connections with things in both the art world and the wider community. It would have liked to have had the opportunity to see a precis of what went on in Kerry Harker’s Artists and galleries seminar but you can’t have everything. After all that interconnecting and activity it was time to sit and take in the presentations from Rebecca Chesney, Anna Francis and Nicola Naismith. This was also the point at which people whipped out their phones to bring in their virtual invitees. I have to say it’s good to see smartphones being used like this however it did give a slightly gimmicky feel to the beginning of the talk. In a weirdly whimsical moment the phones were lined up on one of the chairs at the front of the conference room, I’m not sure if it was off-putting for the speakers but they handled it admirably. It did help in taking away some of the strangeness of having virtual guests in the room when the first speaker was coming to us over Skype. Unfortunately, being a remote connection, it was quite difficult to follow Rebecca Chesney’s talk due to the volume being quite low and the signal generally being a bit dodgy. I found Anna Francis’ presentation particularly interesting. She showed how she had fully embedded herself in a community and was using all the tools at her disposal, with very little money, to make a thriving hub which came across as a really inclusive place to be. That connection to and, I would say, a kind of love of where she lived and worked really came across. Nicola Naismith’s talk was very much about improving the lot of the living artist and covered how artist can help each other and form supportive networks. She also spoke of artists making connections with business as a way of generating both art and income. The speakers all talked about persistence and perseverance as a necessary part of being an artist, they also all spoke of honest communication and the need to be flexible in approach. Reading between the lines there was also, I felt, something about getting help when you need it or building networks with people whose skills complement your own. All of which leads nicely into the Q&A session afterward where the issues of artists being payed, their ability to work (or not) during bouts of illness both physical and mental, and the nature of self-employment generally, all came up. We didn’t have as much time to chew over these topics as I would have like but I’m hoping that they could be subjects for meetings in the future. All in all I think the day was well organised and interesting. I got the feeling that much of the topics discussed many of the artists there already knew however it is never a bad idea to refresh or update knowledge. I also feel that sometimes actually seeing something put down on paper can help define issues in a way which just ‘knowing’ something in your head just doesn’t. One of the things which I would say was a hugely useful element of the day was that each and every person talking to us was talking from a practical perspective rather than just a theoretical one. All of the contributors practiced what they preached and that was both reassuring and inspiring because every woman, and they were all women, was talking and sharing with us, not just their best practice but also their lived experience. I have to say that this is the first symposium I have been to where every speaker is a woman and the majority of the audience were women, too. Since the majority of entrants to art colleges and art practitioners are women these days it should probably not be surprising. I believe that this symposium was a good start to a discussion around art and the business of art and I am looking forward to further information, talks and, maybe, conferences based on some of the things brought up during the day.